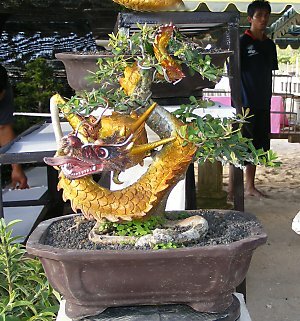 While at the ASPAC in Bali (Sept 2007) I saw in the market area some curiously shaped trees that while not strictly Bonsai were trained and shaped using Bonsai principles. The foliage on these trees, (one was a Juniper Procumbens), was wired and shaped as you would any normal Bonsai, and the trees had a deadwood shari area up along the trunk. But to the deadwood area a dragon had been carved and moulded onto this deadwood, and then painted. They were formed with Claws, Horns, Teeth, and were so well made you could almost feel them breathing fire on you. 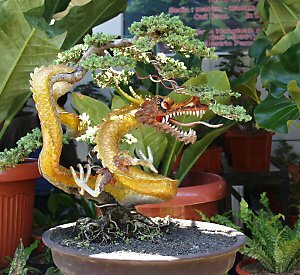 Although not Bonsai, anyone with an artistic flare would appreciate the time and work that went into making these, and the way that they were incorporated into the trees.